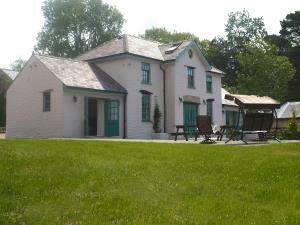 Glanafon Coach House Self-cateringGlanafon’s 5 star self-catering Coach House sleeps eight people. Along with its quirky features, you can also enjoy 24 acres of garden, grass tennis court, games field and 400 metres of private fishing on the Western Cleddau. All of this makes for a very private holiday, yet the county town of Haverfordwest is just 2 miles away. The beautiful Pembrokeshire Coast National Park with 186 miles of walks and beaches are easily accessible as are the stunning Preseli Hills to the North. An ideal base from which to explore or relax in Pembrokeshire. Glanafon’s 5 star self-catering Coach House sleeps eight people. Along with its quirky features, you can also enjoy 24 acres of garden, grass tennis court, games field and 400 metres of private fishing on the Western Cleddau. All of this makes for a very private holiday, yet the county town of Haverfordwest is just 2 miles away. The beautiful Pembrokeshire Coast National Park with 186 miles of walks and beaches are easily accessible as are the stunning Preseli Hills to the North. An ideal base from which to explore or relax in Pembrokeshire. Double bedrooms accessed off twin beds Children welcome from any age. The quickest route is M5, M50, M4 - Sat Nav will usually take you across country - longer route! The Coach House was built in the early 1800 and has two floors. The first floor can be reached by an internal staircase or two external staircases. As this is a period property is is not suitable for wheelchair users.